Submission of sales tax is an important matter, which requires going through specified legalities. Certainly stating, it is a mandatory step in liaison with government rules because every individual has to pay tax levied on the sales of certain good and services. When it comes to the matter of identifying the tax submission dates, every country has its own set off dates. But, many share common dates as March 31st. Now days, with the advancement in technology, the services of sales tax submission are available online too. Every individual or company willing to use the services are required to have login ID and password. In this regard, service tax password declaration form has to be filled by the companies through the website. It saves on quite a lot of time and tends to be a safe option of paying sales tax on immediate basis. 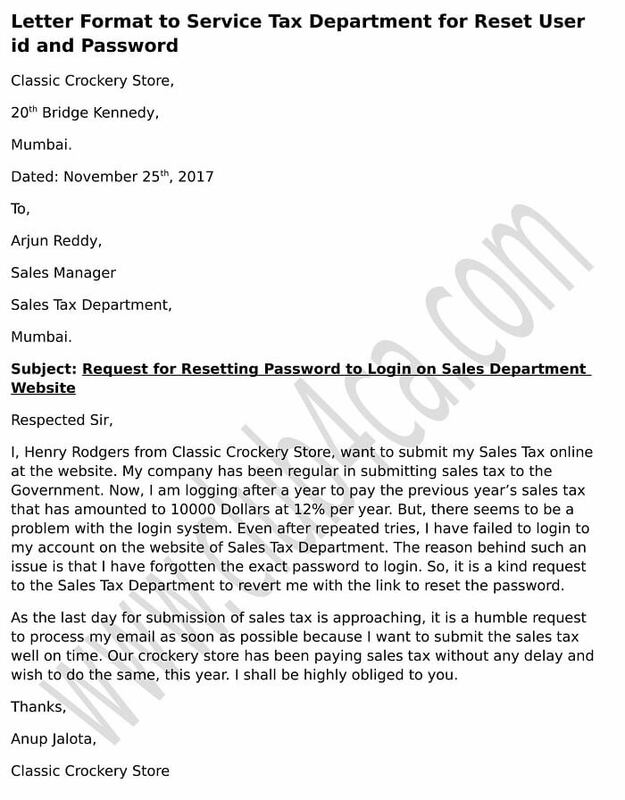 Under-mentioned is a letter format meant to specify sales tax login problem. I, Henry Rodgers from Classic Crockery Store, want to submit my Sales Tax online at the website. My company has been regular in submitting sales tax to the Government. Now, I am logging after a year to pay the previous year’s sales tax that has amounted to 10000 rupees at 12% per year. But, there seems to be a problem with the login system. Even after repeated tries, I have failed to login to my account on the website of Sales Tax Department. The reason behind such an issue is that I have forgotten the exact password to login. So, it is a kind request to the Sales Tax Department to revert me with the link to reset the password. As the last day for submission of sales tax is approaching, it is a humble request to process my email as soon as possible because I want to submit the sales tax well on time. Our crockery store has been paying sales tax without any delay and wish to do the same, this year. I shall be highly obliged to you.